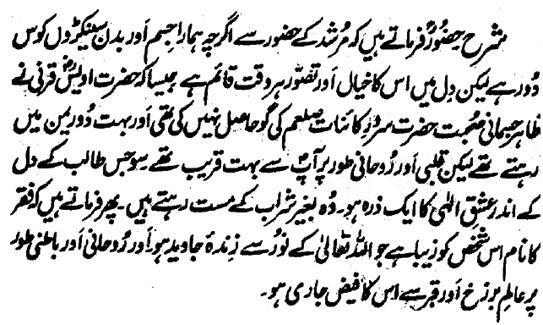 Hazrat Rahmatu-Allahe Ta-aala Alaihe says that 'though our body is hundreds of miles away from the Hazoor of the Murshid but his thought and visualization is all the time intact in our heart like the case with Hazrat Owais Karni Radhi-ya-Allahu Ta-aala Anhu had not a physical companionship with the Holy Prophet Sal Allahu Alaihe Wa Aa-lehee Wa-sallam and he lived very far from him in Yemen but he was very near to the Holy Prophet Sal Allahu Alaihe Wa Aa-lehee Wa-sallam cordially and spiritually. Hence, that Seeker, in whose heart there is a very small part of the Ishq for Lord even, he remains Mast without wine. Then, he says that 'name of Faqar fits for that person, who is the living one forever through the Noor of Allah Almighty and his Beneficence persists spiritually and Inwardly from the Realm of Barzukh and grave.